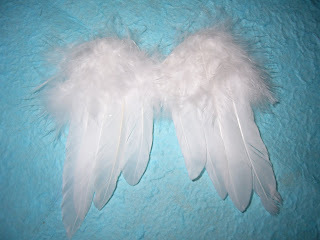 I sent out 10 more Angel Wings today. While it pains me to know that there are so many of us grieving mommy's and daddy's out there, I feel especially honoured to be able to offer comfort, if only in a small way. 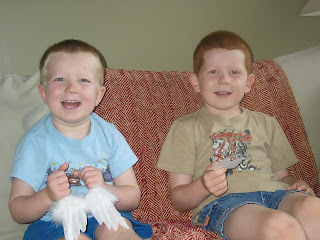 Thought I'd share with everyone a picture of my very special little Angel Wing "helpers". I think they are actually understanding the sentiment behind the Angel Wings Boutique now - especially the oldest. He loves to help mommy cut out the wings and the other continues to call them Nicholas' Angel Wings. He insists that Nicholas must come down and "get them".... if only it were that easy. I have always said that feeling our babies move, wriggle, even kick me hard in the gut (not to mention on all of my internal scar tissue) is the very most reassuring part of pregnancy. To feel that new life growing and thriving inside of you is the single most miraculous thing about pregnancy. I lay down for a few minutes every day just to consciously connect with Little Miss Sunshine. Feeling her flutters. Watching her poke at my belly button puts my heart at ease and makes me smile. She is growing, she is healthy.... she is alive. Having said that though, I must reiterate how thrilling it is to be growing another little being inside my belly. Every one of our children are true blessings. There is no disputing that. Although our lives have been touched by such a unimaginable tragedy, we are a very lucky family. Lucky to be honoured with each of our boys presence and beyond fortunate to be trusted, once again, with bringing another precious babe into this world. It is common knowledge that experiencing a life altering tragedy such as losing a child tests the strength of a couple. Men and women grieve much differently which often leads to couples migrating further and further apart... not being able to connect... not being able to love and remember together. My husband and I have experienced the opposite. We vowed in the very beginning of our journey that we would not become one of those statistics. That we would respect each other. Support each other and talk openly. It's been difficult. It's been tumultuous. It's been seemingly impossible to navigate through our grief at times, but we are doing it. We are choosing to love and remember Nicholas together. We are choosing to love and hold each other, no matter what. It's not easy. Our life path together has certainly taken a turn (or a dive off a cliff) that we were not expecting. Somedays it's as if we must hold on for dear life to just get around the corner. The road is slippery. There is fog in the air and those potholes seem to jump out when we least expect them to. But there is also blue sky ahead. Blue sky and beautiful, white, marshmallow clouds and sun that remind us of Nicholas and what he means to our family. My husband and I constantly remind each other of that. We choose the blue sky. We choose the sun. Nicholas would want it that way. None of this would be possible without the love, guidance and understanding of my husband. For the most part, we speak the same language. We have brought each other through the absolute, most terrifying days that we will ever experience together. Those moments are profound. They were life changing moments that we struggled through together. There is an intimacy between us that no one will ever get close to. He was there... through it all. Holding my hand. Holding his son's hand. Holding my heart as part of it walked through the hospital door. Nicholas' daddy hurts. He misses his youngest son with the same passion that I do. He has said to me before; "you had months to get to know Nicholas while he was growing in your womb. When our world fell apart, I had two hours to get to know him and say goodbye." What a true, raw statement. I agree... and although many say that it is "harder" for a woman to grieve the loss of a baby because of these visceral connections, I say it's just different. It's so very different. Daddy's hurt just as deeply. They hurt for the loss of their child. They hurt for their wife who is enduring the worst possible type of physical and emotional pain. They hurt for their families. They hurt because there is absolutely nothing they can do to stop the inevitable heartache to follow. I love you babe, more than I can express here. We are grieving the deepest kind of loss possible and we are doing it together. Your strength guides me and holds me up. Your commitment to our family is unshakable, and for that I am truly grateful. 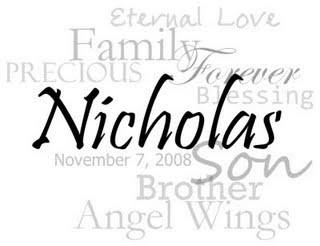 The next few weeks leading up to Nicholas Angel Day, November 7 are going to be tough. They are going to rocky and full of a spectrum of emotions. However, I am confident that there will be days filled with sunshine and big, puffy, marshmallow clouds too. I look to the sky and I can almost see him.... hope you can too. Let's look up together. Hello to everyone - I just came across this poem - thought you may enjoy it too. Just because I’m out of sight. Every morning, noon, and night. And He said, I welcome you. They’ll be here later on. As part of my big plan. He wished for me to do. Every day and week and year. I’m standing there to wipe away the tears. God knows what it best. I’m just beyond the crest. from that land way up above. The beautiful Franchesca at Abiding Hope Collages made this beautiful collage out of words that remind us of Nicholas. I just love it. Thank you, Franchesca! Well, Little Miss Sunshine is doing very well. We had another ultrasound today to check on baby's brain development and things are on track... phew. I swear these appointments knock the wind out of me. I go in trying to stay positive and convince myself that everything will be fine. That what happened with our sweet Nicholas was random. I spend the entire time on that table, belly lubed up, holding my breath and desperately trying to "read" the technician's face for any sign "good or bad". It certainly doesn't help when the whole process at the hospital is completely unorganized. First of all they didn't have my paperwork ready, then, after waiting for 30 minutes the tech tells me I should have gone to some clinic (in the hospital) to pick up my paperwork. So, I go up there.... and of course it's on the maternity ward (memories upon memories), infants screaming all over the place. I pick up my paperwork, go back down to the tech. who looks at the paperwork strangely. EPL was listed on my order. Early Pregnancy Loss. My first thought, of course, goes back to Nicholas. And my first instinct was to jump off that table, high tale it back up to the clinic and throttle the person who decided that my 35 week old baby was an Early Pregnancy Loss. I am not, in any way, undermining the fact that ANY loss is a loss, early or not, but really???? Ends up my brain was on overdrive and they were referring to this pregnancy. No better, really, but at least I can tell myself that my file was mixed up or something. From there, the appointment got better. The technician got friendlier and much more sympathetic (it's really too bad that it takes me telling her about my son who passed away for her to perk up, but whatever). Baby looks great. Still a "sandwich" by the way. My mom actually came to the scan with me today so she had a chance to see the baby on the screen after the exam. A touching moment after all we have been through. From there I was sent back up to the clinic to get the results. Waited another 30 minutes for them to tell me that things look good. My placenta is a little low so they want to watch that - but, hey, if that's all I have to worry about right now, I'll take it. Overall, a tiring, mixed up morning of activity, but certainly well worth it in the end. The following post is inspired by a very close neighbour/friend of ours who watched her 4 year old son get on the school bus for the very first time last week. What she said as the bus pulled away with all of those tiny, smiling faces waving back, has been echoing in my head ever since. We both stood in tears at that bus stop as my oldest son took her son's hand and walked him up those big steps to what would be his first day of Junior Kindergarten. As the bus pulled away, this neighbour/friend looked at me with tears in her eyes and said "and there goes your heart... on the bus." I have been thinking about how so very true that statement is. There are so many times in our life where our heart is seemingly ripped from our chest and then neatly (or not so neatly) tucked back in again. Our children are our hearts. They represent such an important part of us that those kinds of moments and milestone leave our hearts reeling on the sidelines. My husband and I have experienced so many of those moments with our two oldest children. When they first locked eyes with us, when they flashed that first smile, when they started to walk and talk, when they began school. There are so many firsts, firsts that will just continue to cause our hearts to beat out of our chest. Saying goodbye to Nicholas gives "and there goes your heart" a drastically different meaning. Handing him over to the nurse after our precious time with him was nothing short of unbearable. How the Human Spirit can survive something like that is beyond the imagination. My heart went out our hospital room door that day, in the arms of a loving, caring stranger, but, nonetheless, a stranger. He was no longer in his mommy and daddy's arms where he belonged. No longer safe. No longer alive on this earth with us. I honestly believe that my heart literally left my body that day, with my son, with all of the hopes and dreams we had for him. Of course my heart was found again. Not all of it. So much of my love, my protection, my pride went with Nicholas that special day. But some of it was found. Some of it was tucked (not so neatly) back into my chest. How could it not be? That is where I carry my precious boy with me... forever and a day. I'm just starting to "get back in the swing of things" from our summer away. Here is my August entry for The Secret Garden. The nursery was also prepared for when Nicholas was ready to make the transition from cradle to crib. To be honest, there wasn't a lot we had to do to it. We knew we were having another boy and so, the colours (sky blue and cream) were perfect. I had added a few extra touches, as I had for each of the boys, to make it their own. I changed the bedding set to a blue Noah's Ark type theme with a valence to match. I bought him a couple of new blankets and face cloths.... all of which still lay perfectly folded inside the crib. I haven't had the heart to touch anything in the nursery. The door is still closed tightly. The 3-6 month sleepers and outfits still folded away in the dresser. The nursery is right at the top of our stairs, beside our bedroom and on the way to the older boys bedroom. We walk by it every day. In the very beginning I couldn't even touch the door without breaking down in tears. Knowing that those walls would never hear the lovely cry of our third, precious son was the hardest realization. I think I have opened the door a handful of times. Mostly only to "store" a few things. Each time I find myself taking a deep breath and getting out as quickly as I can. I think it would be different if he ever spent time in 'his room'. I think I would feel more of a connection to him there, but he didn't and it's a constant reminder of what could have been... what should have been. We will start over for this new baby. It makes me sad to think that we will erase the love and tenderness that went into creating the nursery for the boys, including Nicholas, however, I just can't bring myself to use 'his' things for this new baby. Nicholas' things belong to him. The nursery, as it is now, belongs to him and his memory. So, we will do something completely different, something to honour this new life, all the while preserving the space we had prepared for our Angel. Having said all that, I still haven't opened the door. I have some ideas in my head as to what I would like to do.... I just haven't got the courage to actually plan it out yet. Maybe because I feel like we may jinx things. Maybe because I am subconsciously protecting my heart. Whatever it is, soon enough we will get our butts in gear and create a new, special space for Nicholas' baby sister... and I know he will be proud. 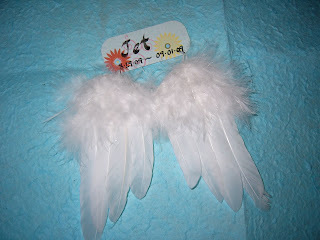 Just wanted to let you all know that I have created a new blog for the Angel Wings Memorial Boutique! I will be continuing to "tweak" it here and there, but please feel free to have a look and let me know what you think. You know how much I value your opinions! Thank you so much to my beautiful bloggy friend, Carly for taking the time to help create a gorgeous blog button for the Angel Wings - Memorial Boutique. We both agreed that the button should be simple and delicate. I love the colours as they offer comfort and calmness. It turned out simply gorgeous. Thank you again, Carly. Cheryl at We Are Nine has passed on a very special Friend Award to me. I am truly honored. Thank you Cheryl for such a meaningful gift. This award is bestowed on to blogs that are exceedingly charming. These kind bloggers aim to find and be friends. They are not interested in self-aggrandizement. Our hope is that when the ribbons of these prizes are cut, even more friendships are propagated. Please give more attention to these writers. Deliver this award to six bloggers who must choose six more and include this cleverly-written text into the body of their award. It is sooooo difficult to only choose 6 bloggers who have touched my heart in such a profound way. There are so many of you who have enriched my life and made this life-long journey just a little bit more bearable. 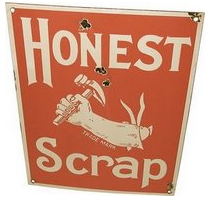 Freja's Mommy at Lost For Words for the Honest Scrap Award. Thank you to all of these fabulous ladies and mommies. I know some of your stories well and others I am just beginning to learn about. It makes me feel good to know that someone can relate to what I say and feel. 1. I truly believe in Angels... now more than ever. 2. I would walk to the end of the earth for any of my boys. 3. My most favorite place in the world is at our family cottage - my husband and I were married there, overlooking the lake. 4. I have two younger brothers.... always wanted a sister. 5. I have a University Degree in Industrial Relations (Human Resources). 6. I hold my true friends and family close to my heart. 7. I would love, love, love to learn how to ride a horse. 8. I pray daily for a healthy, happy, chubby, rainbow baby. 9. I love white wine (with ice cubes) and am really missing it right now! 10. I fall more in love with my husband every single day. We returned from our summer vacation yesterday. I was anxious to get home and get somewhat organized for the first day of school (today). In between the 'organizing' I was also looking forward to catching up on some blogs and checking in with some very special women I have met on-line all around the world. I knew I would be reading about some rainbow babies being born and was particularly interested in Mirne and Craig's news. I am in complete and utter disbelief that another beautiful baby has been taken away from these amazing people. I sit here trying to find the words to describe the horror and unfairness of it all. Mirne and Craig have brought 3 gorgeous little beings into this world and without any warning they have been taken away. I am stunned and so saddened for this family. My heart aches for friends I haven't even met. For a mother who is in the most indescribable pain imaginable. For Freya, Kees and Jet who had such a short time to feel the depth of their parents love here, on earth. Please keep this family in your hearts. "Fly, fly little wing. Fly where only Angels sing..."